Jefe’s has been adopted by Connie. Jefe’s first owner…. El Jefe has always been a big puppy dog. Before coming to his second home, he was turned out every day in a huge grassy paddock with a thoroughbred mare that he loved. 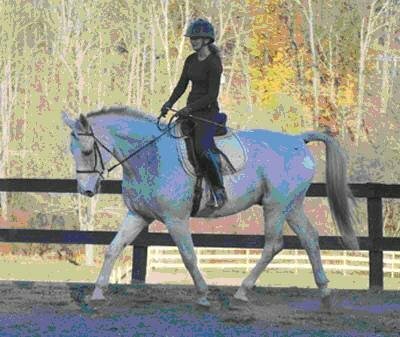 He did trail rides, events, hunter paces and at one point went to college with his owner at the time, but returned shortly as she did not have enough time for him. He was never spooky, and loved the trails. Jefe had no health issues and was a happy horse. Jefe’s second life… Jefe arrived in Spring 2006 at the farm. He was leased out to one rider who worked him over fences (he could jump about 3′ consistently) and take him out on trail rides and hunter paces. 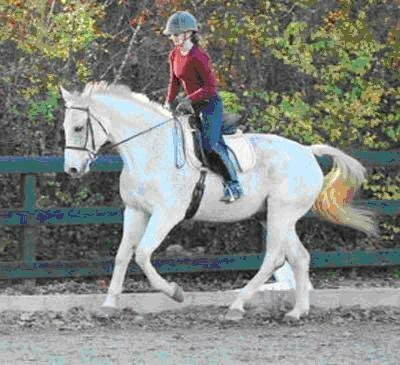 He had another rider who was improving his training in dressage. Eventually he became a school horse where he was very tolerant and patient with all levels of students. He lounged decently (could still use a little work but got the job done). After time Jefe’s vision in his right eye began to deteriorate. 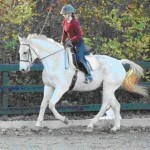 Jefe was no longer able to be used in jumping lessons and took some time off. After the vet assured us that he could still see, just “through clouds” Jefe began working again on the flat and out on a few trail rides (he needs a patient intermediate rider as he will look at things if he isn’t sure about them with his right eye). 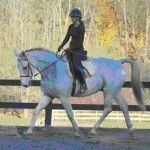 In the fall of 2009 Jefe began training again as a dressage horse. Jefe has a sweet personality, but over the past year we have seen him spook in hand about 5 times, in which case he will rear up and if he is not let go of, will strike out. For this reason Jefe would not suite a beginner that does not have horsemanship experience. The rest of the time Jefe is a happy pleasant horse that just wants some love and attention. Jefe has never had any other health or soundless issues and is not on any supplements or special dietary needs. He has been turned out with a number of different horses, and is fine as long as he has the right fit. He has currently been going out alone off-grass as that was simply the current paddock available for him. Jefe would make a pleasant horse for anyone that is not looking to jump, has an equine background, and is ready to love him.